ABP celebrates a milestone as the Port of Hull’s two £10.5 million cranes serve their first shipment. Thea II was the first ship to be processed by the 50m high ship-to-shore gantry cranes, which are equipped to handle ships with more than 500 standard containers. Last Friday morning, the ship arrived from Amsterdam and it discharged and loaded 180 containers. The newly-expanded terminal that can now handle double the capacity – some 400,000 containers per year – is going from strength-to-strength as it has recently secured three new weekly sailings from Amsterdam to Hull with Samskip. “After taking around a year to construct and even longer to plan, seeing these colossal cranes up and running ahead of schedule is a highly-anticipated moment,” said ABP Humber director Simon Bird. “These huge pieces of kit will be part of Hull’s skyline for at least 20 years serving around 10,000 vessels in their lifetime. The Humber container ports – Immingham and Hull – has seen 28 per cent growth compared to last year. 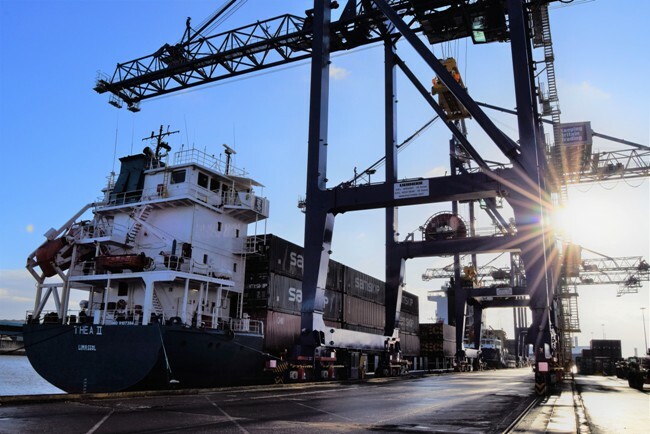 As previously reported, ABP has committed to investing is £50 million in its container terminals on the Humber – located in Immingham and Hull – in response to continued growth in demand. The 600 tonne cranes were built by Liebherr in Ireland and they arrived fully-built by a heavy lifts vessel in February 2018.